During people’s lifetimes, 1 in 2 (52%) adults have experienced a moment whereby they realised they had turned into their Mother with females (81%) significantly more likely to have experienced this moment compared to almost a quarter of males (23%). Ahead of Mother’s Day, which takes place this Sunday (26th) it has been revealed that 1 in 5 (19%) adults claim to have forgotten to buy their mother a gift for Mother’s Day on a few occasions, with Males (26%) guiltier of this compared to their Female (12%) counterparts. 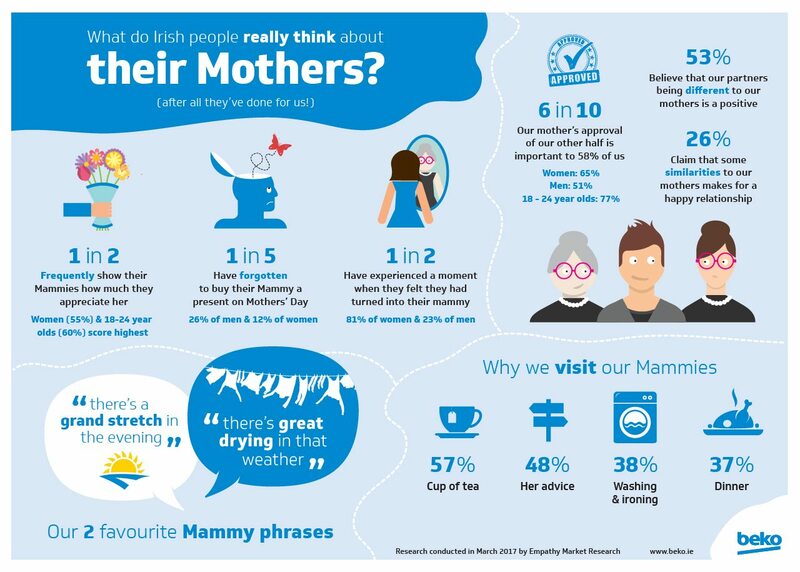 Ahead of daylight saving time/the clocks going forward an hour this weekend, ‘There’s a grand stretch in the evening’ has been revealed as one of our top three favourite Irish Mammy phrases along with, ‘There’s great drying in that weather’ with, ‘A letter came in the post for you, will I open it?’ finalizing the top three. Focusing on relationships, our Mother’s approval of our other half is important to 6 out of 10 (58%) of us, with her approval being more important for females (65%) compared to males (51%) and interestingly highest for those aged 18-24 (77%). Our partners being different to our Mothers is viewed as a positive and makes for a happy relationship for 1 in 2 (53%) adults. Conversely, 1 in 4 (26%) claim that having some similarities to our Mothers can make for a happy relationship. In terms of what adults still rely upon their Mothers for, advice (39%) comes in highest followed by a dinner (23%) from time-to-time. Those aged 18-24 appear highly reliant on their Mothers for cooking dinner from time to time (68%) and washing & Ironing their clothes (51%). If you know a Mum who deserves recognition, complete the nomination form in the current issue of Woman’s Way or log onto www.womansway.ie. The closing date for entries is May 5, 2017.